I’ve come to the conclusion that there’s power in patience. Consider anyone you know who seems especially patient, and you’ll see a person who is in control. I don’t mean in control of their circumstances or in control of their life but in control of themselves. Patient people tend to be relatively measured and calm. They have perspective. They don’t miss the forest for the trees. They’re fully present in the moment, and they don’t let frustrations derail them. They have self-control. In fact, they can sometimes make patience seem easy… even effortless. But, make no mistake, it’s just as hard for them as it for the next person. The difference is in the practicing. Practice makes permanent. Practice makes patience. Patience recognizes that, while we often can’t control an outcome or timing or circumstances or people, we can always choose to control our response. In fact, patience is like a diet. Most diets operate under the premise that you need to eat a certain way for a certain amount of time so you can achieve the results you want, and then life can continue as it did before. Only, all too often people end up gaining back all the weight – and then some – because the diet wasn’t sustainable. The truly sustainable diet isn’t a diet at all… it’s making a change in eating habits that’s practical for the long haul. It’s only once we accept that there’s no magic formula… just a new way of life and a new way of eating – one bite at a time – that real change happens. The same is true with patience. We will become more patient once we come to the realization that patience isn’t a quick fix, but a change of mind. It’s changing how we react to disappointments, waiting, anger, frustration, things not happening that we wanted, or things happening that we didn’t want. Or things happening in a different way or a different timing than we’d hoped for. Step by step, patience is developing a determination to change the things we can change – ourselves… our actions and our reactions – and turning the things we can’t change over to God. But, what if you’re like me, doing reasonably well with patience in many ways but feeling like you’re fighting a losing battle in certain situations? Well, the Bible has the answer for that. When I come to the end of myself (which is often…), Jesus is always there to fill up my weakness with his strength. And, what He’ll do for me, He can do for you. Patience is foundational to navigating life. But, patience doesn’t come easily to most of us, perhaps because it gets tested so many times in any given day. Last week, I was driving in the middle of three lanes of northbound traffic during rush hour traffic through an intersection where they’re constructing the first diverging diamond interchange in Canada. As I started to pass under the recently laid spans of the bridge deck, a heavy piece of bolted metal dropped onto the hood of my car, leaving distinct indentations and damage to the paint. Two days later, we took our 21 month old British bulldog on a rare drive only to have him pee on the seat between us shortly after we had stopped to give him an outdoor pee break. The day after that, I wrote an entire blog post that disappeared forever just as I was about to publish it (even though I had saved it numerous times throughout the process). A couple of days after that, life threw me an unexpected – and unpleasant – curveball that I didn’t see coming, and that I’m continuing to have to deal with. Several months ago, I had received a recall notice in the mail for my car, which I took to the dealership only to discover that the notice was for my last Nissan vehicle. The one I had traded in 3 1/2 years earlier. I phoned Nissan Canada to have the error corrected, and then promptly forgot about it until today, when I received a second recall notice in the mail for the same vehicle. I did reasonably well with 4 of the 5 instances I’ve described above but I assure you that’s not always the case. Patience is something I grapple with circumstance by circumstance, and I’m reasonably certain I’m not the only one. Just this past week in the news… Justin Bieber got decked after punching a guy in the face in Cleveland. Twin sisters got in a physical altercation while driving in Maui, and one lost her life when the car subsequently plunged off a cliff. A disagreement in a Costco parking lot in Toronto turned into a brawl between two middle aged couples, prompting one news source to say that we’re living in an age of rage. It’s easy to be impatient and hard to be patient. But patience is worth it. Impatient people are rarely happy people and usually not that fun to be around, not to mention that others tend to notice when you do things that go against the tide of human nature. Sometimes you even get featured on Oprah. But, God always notices even if no one else does. My goal, my prayer, and my hope is that I will get patience right far more often than I don’t. That the times I demonstrate patience will point others to the One who is able to do in me exceedingly abundantly above all I could ever ask or think. Peace is an interesting topic because many people want it, few have it, and most don’t know how to get it or keep it. Peace has been around since the beginning of time, starting in the Garden of Eden. Adam and Eve never had a single argument, no one was at war, and even the animals all got along. Peace never crossed their minds because they didn’t know a time where they didn’t have it. For one brief time in history, there was peace. But, then sin entered the world when Adam and Eve ate the forbidden fruit, and mankind has struggled to keep a grasp on peace ever since, starting when Cain murdered his brother Abel, and quite possibly when Adam and Eve had an argument or two over whose fault it was that God had banished them from the Garden of Eden. I confess it felt weird to do that the first one hundred times or so but I’ve come to appreciate that it’s one of the nicest things we can say to each other. There’s power in speaking peace into someone else’s life, as well as having peace spoken into your own life. Words aren’t the only way peace is conveyed. For centuries, the dove has been a universal symbol of peace, as has been the olive branch. And, in 1958, a British designer and artist, by the name of Gerald Holtom, designed an actual peace symbol. Peace must be important to our well being for there to be so many different ways to communicate it. After all, consider that wars rage, terrorists terrorize, people feud, families divide, and it can be easier to hate than to love. Some people are even at war with themselves, as evidenced by self-harming behaviours and self-hatred. You don’t have to look very far to find people needing peace. Sounds straightforward, eh? Well, in practice, we’re imperfect people trying to perfectly trust God, and that affects our peace. Oh, we can have moments of peace… and maybe even stretches of peace… but then something happens to cause inner turmoil or external turmoil in our lives, and our peace goes out the window, just like that. It’s like riding a bike. It’s easiest to ride on level plain, with no obstacles in sight. But, add some rough terrain, a few obstacles, and a couple of steep hills, and it’s another story entirely. You find yourself having to stand up to pedal or maybe you have to get off your bike and start pushing. Sometimes you need someone to come alongside you… either to help push or simply to encourage you. Someone to help you bear your load. because they get more done by working together. But, then there are the sweet moments when you find yourself at the top of a hill. The bigger the hill, the better. And you can just soar to the bottom without having to hardly touch the pedals. It’s in those moments when you can just enjoy the ride, and revel in the joy of the journey. I’m stressed out. Tired and stressed out, to be precise. Those two words stopped me in my tracks and highlighted the fact that I’ve been feeling the opposite of peace. The truth is I haven’t been feeling freedom from anything. But, I’ve started taking steps to figure out how I can keep stress from dominating my life. Especially since the “adverse and demanding circumstances” that contributed to me becoming so stressed are probably not going to go away anytime soon. Well, my hubby and I are going on vacation just 4 short days from now, and I’m pretty sure that 8 days in Puerto Vallarta will go a long way to helping my stress. But, that will only be a brief respite, after which life will resume and, no doubt, my stressful circumstances. It was recently suggested that I need to regularly spend time with a trusted friend or two who I can confide in, and who appreciates me for the person I am. I do have those people in my life but they mostly live somewhere else, which is the downside of having moved around a lot. But, there are a couple of friends where I live who have the potential to become close relationships. So, one of my goals is to become more intentional about deepening those friendships. The closer your support system, the better. It was also suggested that I be kinder to myself, and regularly indulge in some of the things I most enjoy. Things like going for a massage, taking a brisk walk, baking, reading, blogging, having date nights with my hubby, getting together with a friend for coffee, watching a movie, etc. These ideas seem somewhat simplistic on the surface but I do enjoy them, and they’ve been falling through the cracks in direct proportion to how stressed I’ve been feeling. Basically, I need to work smarter, not harder. The goal is to manage my stress rather than have my stress manage me. I’ve done a few of the things I enjoy this week but, to be honest, I still don’t feel much better. I do think our vacation will help jumpstart the process, and I’m very thankful for the timing. From the moment we leave the driveway until we return 8 days later, nothing but rest and relaxation will be on the agenda. I plan on taking full advantage of being out of the country… spending lots of quality time with my hubby, sunbathing, swimming, snorkelling, eating, reading, sightseeing, and sleeping. I just need to remember that I didn’t get this stressed overnight so I won’t get unstressed overnight either. But, simply having a plan makes me think that peace is at least possible. I especially need to remember that God is bigger than anyone or anything that’s been causing me stress. It’s easier said that done but committing my circumstances to Him, and trusting that He will intervene in the right way and at the right time will go a long way to being able to feel peace in the midst of the storm. I’ve been praying a lot but maybe I need to be still and listen more too. It’s hard to hear that still small voice when I’m doing all the talking. I’m actively in pursuit of peace… my own version of “freedom from”, and I’m looking forward to seeing how it increases my joy. Everyone wants to be happy. It’s a universal desire. People wish for happiness, think about it, strive for it, read about it, talk about it, and even try to buy it but rarely, if ever, experience it on any sort of regular basis. How can so many people be on the quest for the same thing but still miss out on it… or experience it only in fleeting moments? Sometimes it’s because of a misguided wish for things that don’t actually bring happiness while other times it’s an unrealistic expectation of what happiness is. What if I told you that happiness is within your reach? That there are a few things you can do today to start increasing your happiness? 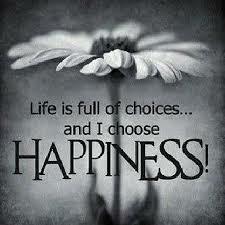 It might surprise you to hear that happiness is a choice. If you tend to see the glass as being half empty, make the decision today to start choosing to see it as being half full. Your happiness largely depends on your attitude (even more than it does on your circumstances). No one ever gets to the end of their life and wish they had worked more. The better your work-life balance, the happier you’ll be. And, while we’re on the subject of work… as much as it’s within your ability to do so, do something you love or enjoy. So, if your job is making you miserable, it might be worthwhile to either look for another job or to go back to school to train for a different career. 3. Focus on experiences, not things. Things will never bring you more than fleeting happiness. When people reminisce about happy times, they’re almost always referring to intangible things. Spending time with others, cultivating relationships, giving their time and talents to make a difference in other people’s lives. All things that money can’t buy. It’s also worth remembering that the quest for tangible things tends to make people work more, not less, and often brings the added stress of debt. Two big happiness busters that everyone can do without. 4. Be social (and I’m not talking about social media…). Loneliness leads to higher rates of depression, health problems and stress. Having just one close friend tends to boost happiness. But, you don’t have to rely on friends and family in order to be social. Smile at people. Say hello. Make small talk with strangers. Take a genuine interest in others. Life is meant to be shared. Denmark is one of the happiest nations in the world largely due to their high volunteer rates (43% of the population volunteer). Giving of your time, possessions, or money can boost your happiness like few things can. Volunteering makes a difference, improves your community, and helps you keep a healthy and balanced perspective. Science has proven that laughing decreases your stress hormones and increases your endorphins (the same brain chemicals associated with the “runner’s high” you get from exercise). Laughing is also good for your heart. A study found that only 8% of heart patients who laughed daily had a second heart attack within a year, compared with 42% of the people who rarely laughed. What if you don’t feel like laughing? Consider faking it ’til you make it. Just like your attitude, laughing is a choice. Faith in God boosts happiness because it brings purpose to life. Resting in the certainty that God is in control, and that your eternity is sure, bring happiness like nothing else can. Focusing on what’s going wrong, what we think we’re missing, or what we wish were different are all happiness busters. Making a conscious choice every day to count our blessings is a big happiness booster. Even the days that are largely a write-off – just think about the fact that each day only has 24 hours, and that tomorrow is a new day. That thought should bring you happiness. It does to me! Ok… enough talk about happiness. Time to start doing. 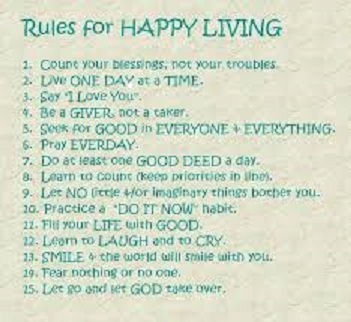 Go and live a happy life… NOW!!! This past week, Calgary experienced what has been dubbed as “Snowtember”. Three days of heavy, wet, snow that put 2014 into the record books. Power wiped out to thousands, dozens of traffic lights on the blink, numerous closures and collisions, and “Treemagedon”. 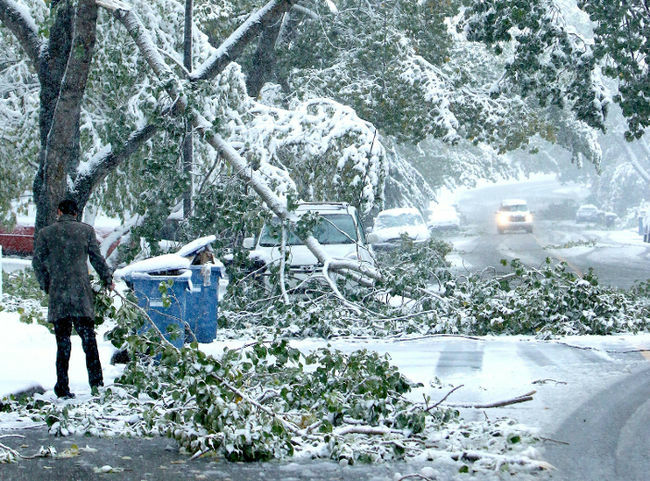 An abundance of leaves still on the trees plus a large amount of snow combined to cause approximately 2,000 trees to collapse onto roads, power lines, and vehicles, and thousands more to fall on private property. Countless other trees lost branches that still litter driveways, roadways, pathways, and sidewalks. Last night, I went for a long walk to enjoy the beginning of the gradual transition back to seasonal weather. As I walked, I couldn’t help but survey the “Treemagedon” damage because it was literally everywhere. But, what I found most surprising was that the majority of smaller and more delicate trees survived virtually unscathed while the larger and seemingly hardier trees were the ones that tended to suffer damage, many irreparably so. Which was strange because, after all, it’s the mighty who stand and the weak who fall. Well, just ask David and Goliath about that. Goliath was a giant… approximately 10 feet tall. Huge by anyone’s standards. To make matters worse, he was a nasty giant. He was so cocky that, after taunting the Israelites twice a day for forty days, he challenged them to send out a worthy opponent to square off against him once and for all. The stakes were high… if the Israelites lost, they would become subjects of the Philistines (also a nasty bunch…). Typically, matters of that nature were settled by a full scale battle, not one man against another. So, to challenge the Israelites in that way, I think Goliath was convinced he was invincible. I also think he just wanted to show off. He knew that any opponent would be very small by Goliath standards. Well, the opponent who stepped forward to accept the challenge was small. In fact, little more than a boy, according to the Bible. So, I’m guessing the Israelites must have been despairing at that point, since the pending duel was looking like it would be a case of no contest. But, appearances can be deceiving, and they certainly were this time. David cast off the armour that the king tried to put on him because it wasn’t familiar to him. It’s interesting that, in contrast, Goliath was decked out in armour from head to toe. Ten feet tall and you need full armour??? Seems like a case of overkill to me (no pun intended…). But, David didn’t miss a beat. He didn’t let fear of his opponent turn him into someone he wasn’t. Staying true to his shepherd roots, he stepped forward for battle, not with a sword, but with a slingshot and five little stones. The Israelites must have really been sweating by then! Just five little stones. But, four of them proved to be unnecessary. Predictably, Goliath made the first move but David courageously responded by not just running to the battle line but by running quickly (!) to the battle line to meet him. David slung the first and only stone, and the giant came tumbling down. Dead before he hit the ground. Oh, how the mighty fell. Appearances can be deceiving… that statement bears repeating. It’s often a storm or other adversity that separates the oak from the seedling. We naturally assume that the oak will prevail but size and outward appearances are no guarantee of strength or success. History is full of examples where the underdog prevailed. Often for reasons as inexplicable as the smaller, delicate trees surviving what the bigger, hardier trees did not. I’m reminded yet again that it’s what’s inside that matters most. David had character, courage, persistence, and humility. He was a small boy with unwavering faith in a God who was way bigger than the giant in his life. A God who is way bigger than the giants in our lives. The challenge is often given for us to dare to be a Daniel (good advice, btw) but I would also throw out the challenge to dare to be a David. Be small but mighty. Go and slay a few giants. To quote an African proverb… “if you think you’re too small to make a difference, you haven’t spent a night with a mosquito”.